I was pre-approved for this ARC via Netgalley. I actually own a couple of books by Reeve, but sadly I haven’t read them yet. 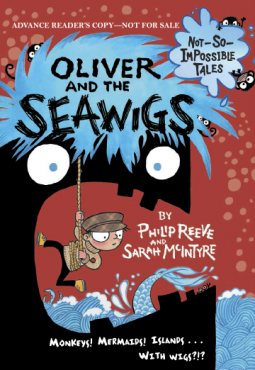 At any rate, Oliver and the Seawigs was simply adorable! I’m always interested in checking out children’s and middle grade fiction and I instantly fell in love with McIntyre’s illustrations. The characters have big, beautiful eyes and I especially loved Iris the mermaid. The book (at least my copy of the ARC) is just done in black, white and grey-blue and this simple mix really highlighted the details in McIntyre’s illustrations. I especially loved the small details, like little crabs making faces throughout the pages, or the odds and ends tangled in Iris’s hair. The book itself was simple, but fun. It’s recommended for ages 7-10 and is certainly something I could see myself reading to my little brother (who is 6). Oliver is curious and brave – an excellent little role model. Reeve has a whimsical way of writing, but he also throws in some bigger words and ideas, such as having an albatross for one of the main characters, and also giving children tips on what sarcasm is and how to avoid it. The main theme of the story is to stand up for what you believe in and support your friends, even if that’s not the popular thing to do. At under 200 pages this could easily be something to tackle over a night or two before bed. This would make a great gift for any children interested in a little high-seas adventure, or for the would-be explorers out there.